having lost their means to earn a living, communities are increasingly using their vote to drive home the message they distrust the State. Tribals who lost their agricultural land in a forest area because of faulty implementation of forest rights laws in Maharashtra are as peeved as fishers in the Tamil Nadu-Andhra Pradesh border who are not allowed to go to sea each time the country celebrates a satellite launch. In West Bengal tribals debarred the police from entering their territory saying they were being highhanded. People belonging to the Pawra tribe in Chopda taluka of Maharashtra's Jalgaon district did not turn up to vote on April 23. The adivasi panchayat had decided in early April they would boycott the polls to protest the district administration robbing them of their rights over forestland. About 20,000 Pawra tribals live in the 30 villages of Chopda. Members of the tribe said the district administration denied them lease to forestland under the forest rights Act, 2006, though they fulfilled eligibility criteria. The Act recognizes the rights of scheduled tribes and forest dwellers over forestland. People said they submitted their claims to the forest rights committee (frc) that recommends cases to the sub-divisional committee. The frc did not present the claims before the village-committee which weakened their claims and gave the sub-divisional committee a convenient excuse to reject them, said Pratibha Shinde, of non-profit Lok Sangarsh Morcha that works in the area. The final arbiter on forest rights leases, the district committee, chose to go along with the sub-divisional committee's decision. "The tribal people approached all political parties for support but none came forward to help them. They have decided not to vote," said Ambarish Rai, president of the non-profit. Jalgaon's district magistrate Kunal Kumar said a few tribals might have been left out in Chopda taluka, but 80 per cent rights were distributed in March. Satellite launches from Sriharikota island in Pulicat lake in south Andhra Pradesh means frequent bans on fishing in the lake. This has affected the fishing community dependant on the lake and the sea beyond for income. Sriharikota is a barrier island that separates the lake from the Bay of Bengal. On April 7, the fishing community took the decision to stop politicians from entering their villages as their demands to lift the ban, had not been met. They may boycott elections on May 13. "Earlier, they would stop us from venturing into the sea for three days during the time of the launch, but from last year this was increased to 20 days. In 2008, there were three launches, so we lost 60 days of fishing," said K Bharathi, president of the South Indian Fishermen Welfare Association. Lalgarh in West Midnapore district in West Bengal has been on the boil since November when tribals alleged atrocities by the police investigating a bomb attack on the chief minister's convoy. The cluster of 118 villages that has strong Maoist presence is out of bounds for the police now. Tribals are demanding an apology from the superintendent of police. It was uncertain if polling could be held in Lalgarh on April 30 since security forces are barred from the area. The government was in a dilemma: not holding polls would mean acknowledging Maoist control over the area. A false step could cause a bloodbath. 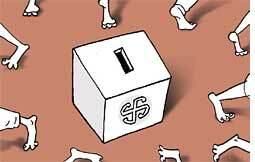 A formula was finally worked out by the chief election commissioner, the tribal leaders and state government officials. They decided the 40 polling stations would be clubbed in five centres and voters would be ferried there.